Pinch of Nom is a true phenomenon, from being the UK’s most-visited food blog to a cookbook which has become the fastest-selling non-fiction title of all time. Pinch of Nom is the UK’s most-visited food blog, with an online community of over 1.5 million. Now, their cookbook, has become the fastest selling non-fiction title of all time. Published on 21st March 2019, the debut Pinch of Nom cookbook has sold over 210,000 copies in just three days. What is it that makes Pinch of Nom truly remarkable? While their delicious, easy-to-follow recipes that are compatible with the principles of the UK's most popular diet programmes have made Pinch of Nom beloved nationwide, it is the power of a community supporting each other towards a common goal that has seen this movement reach extraordinary heights. The Pinch of Nom site was created in 2016 by Kate Allinson and Kay Featherstone, a chef and restaurateur from The Wirral, with the aim of teaching people how to cook. When the pair embarked on their weight loss journey, they began sharing healthy, slimming recipes and watched their community grow at an amazing rate. The debut cookbook from the UK’s most-visited food blog is full of 100 delicious, healthy recipes, from family favourites to fakeaways. 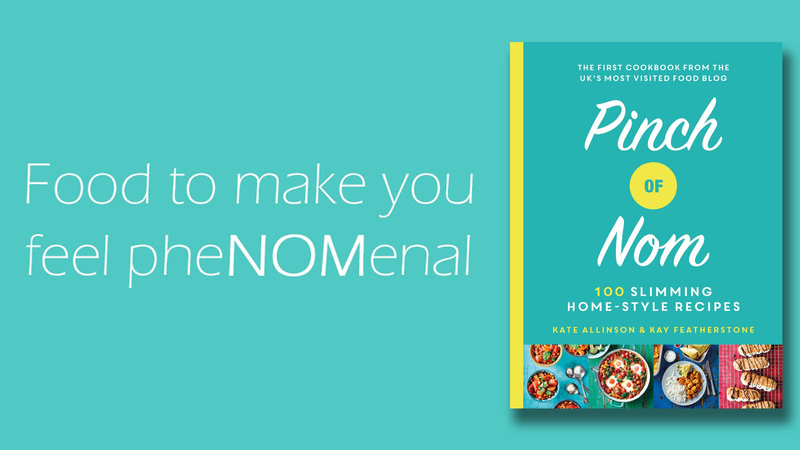 Pinch of Nom will inspire both novice and experienced cooks to create exciting, flavourful and satisfying meals, and all of the recipes in the book are compatible with the principles of the UK's most popular diet programmes.